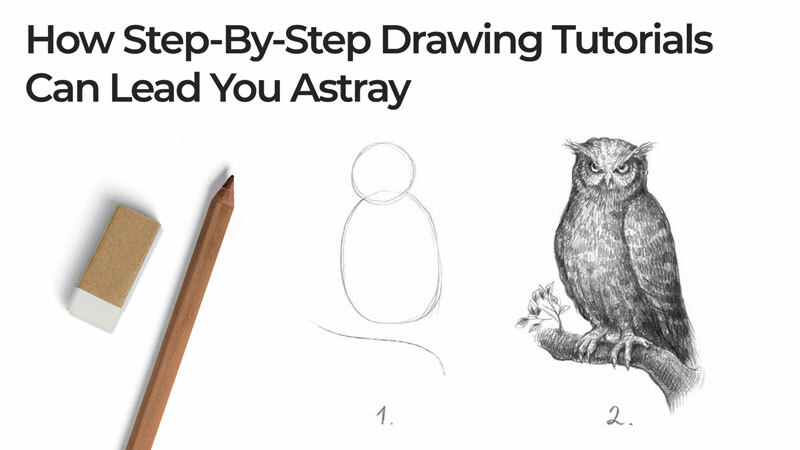 Are Step-By-Step Drawing Tutorials Holding You Back? There are many resources out there on drawing. There are various schools and courses, both online and offline classes, books and magazines. It seems that these days, we have everything to improve at our disposal, right at our fingertips. Step-by-step tutorials are a habitual part of this system – we see them everywhere, especially on blogs and websites about visual art techniques and creativity. To be honest, some tutorials are stellar – their in-depth approach and attention to detail is amazing! It’s possible to learn a lot of great tips just by observing how an artist has created his/her art. As an educational resource, drawing tutorials seem fascinating. They usually are quite easy to understand due to the small portions of information for each step. Also, they are visually consumable. They use a notable feature of the human mind – the ability to learn through repetition of someone else’s actions. 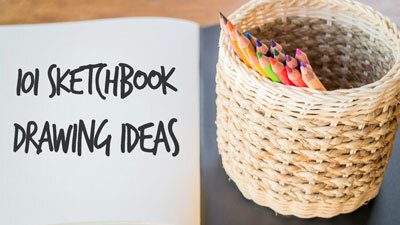 Many beginning artists start their creative journey by following numerous tutorials, focusing on this activity of consuming information and practicing. It seems that there is nothing wrong with this way, but it may lead an artist into a trap. Do you feel like copying the step-by-step process of other artists keeps you from making a real progress? In this article, we’ll explore the pros and cons of step-by-step tutorials. I’ll also share several keys to an effective and balanced practice. It’s worth mentioning that the topic of this article is controversial. There are many nuances and every situation is unique. The point of this article is to provoke thought, and hopefully, make your learning process faster and more effective. will bring the desired outcome. In the case with drawing, this method presents both an advantage and the drawback: tutorials are specific. This means that we have a specific topic/object that we are going to study, a specific arrangement, light and shadow pattern, color combinations, textures, etc. Even the art supplies are quite specific for each tutorial! There are always many possible ways to draw this thing or that, depending on the lighting conditions, the environment, the positioning, posture, and other variables. In other words, we can see how a specific person demonstrates their specific way to draw something through a tutorial. But is it the only way? Is it the most effective way? The danger of tutorials is that following them exactly as they are may create an isolated, limited style of thinking – just as if every subject required a separate set of unique actions. However, is it true that, for example, drawing a fish is totally different than drawing a flower? This risk is real because an artist may have a perception of practice, which in reality, is only a waste of time without much real progress. 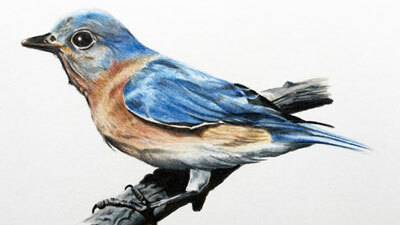 The most effective form of tutorials teaches an artist a system that includes the techniques, their connection to the core principles of drawing, and the way of making certain decisions based on that connection. This system can then be applied to any subject that you wish. If an artist is too attached to the step-by-step method, simply changing the pose of an object may leave them without any clue as to how to draw it. 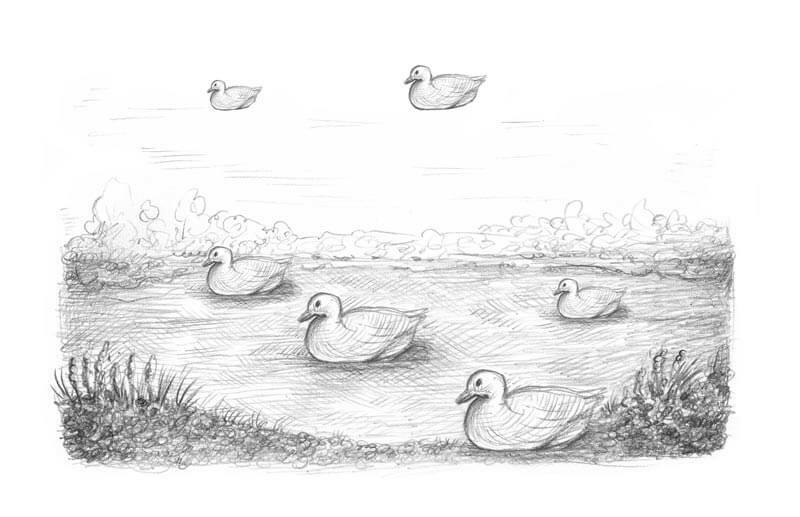 In the image below, you’ll find an illustration of this idea: let’s say a beginning artist used a tutorial to find out how to draw a duck, but couldn’t figure out how to apply any changes to the bird. The result is a repetition of the same duck, with the same pose, shading, etc. Also, this image lacks compositional balance and atmospheric perspective, which might be fixed quite easily just by practicing the fundamentals. Does this image look believable? Of course, this example is extreme, so don’t take it too seriously. However, an unbalanced attachment to step-by-step tutorials may lead to similar results. 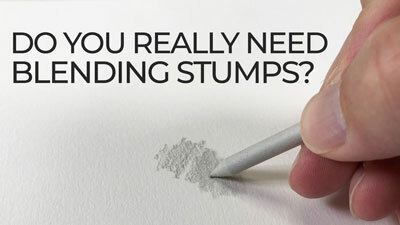 Firstly, the best way to learn drawing is to start with the fundamentals. They are the basis for true artistic development. 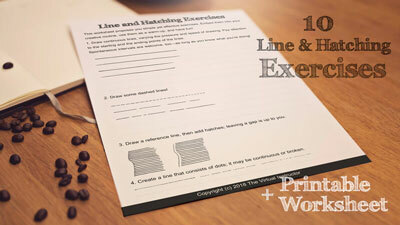 Learn about line, shape, form, value – and how to use this knowledge in your practice. It’s also important to get the basics of perspective and composition. Drawing is a complex skill, so be prepared to study several ‘disciplines’ that are interconnected. Secondly, draw from life, do simple exercises, train your skills of observation and analysis. This will get you much further than solely copying tutorials that talk only about tips and tricks. I’ve been told that 80% of success is the artist’s observations skills and the technical ability to draw is only 20%. Although we can’t prove the reliability of this percentage, it may be useful to think about this concept. A practice centered on observation will help you build a skill of seeing the inner and outer structure of various objects. You’ll find overlaps and similarities between many things that didn’t seem connected in any way before. Following this path, you’ll gradually become independent. By practicing your observation skills, you’ll also improve your ability to draw from imagination. Let’s be objective, not every tutorial explains the process clearly enough. Some instructions are approximate or rough. They don’t offer any clues to the core principles of drawing. They only provide an illusion of knowledge that can’t be understood and fully transformed into a personal experience. Just remember if you can’t understand instructions or they don’t seem to be working properly, it doesn’t mean that the problem is 100% with you. There is another concern with step-by-step tutorials. Sometimes we’re looking for a tutorial on a specific subject, but can’t find exactly what we need. 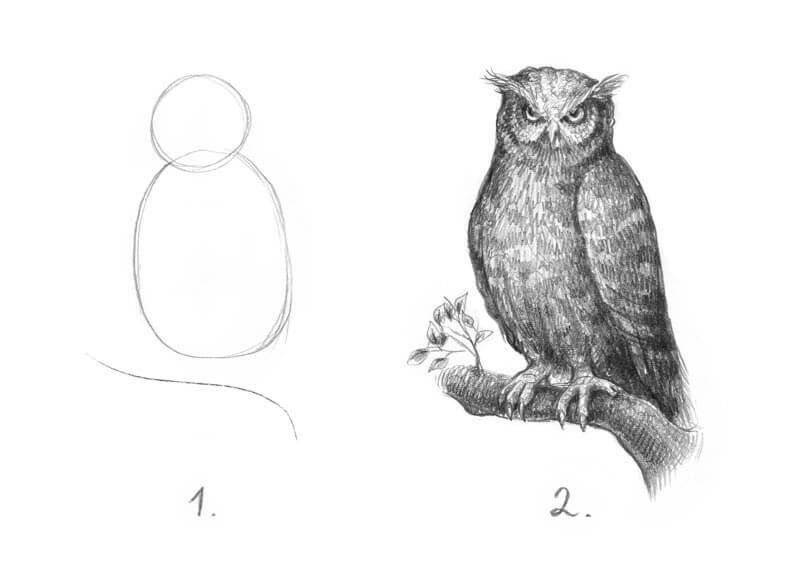 For example, if an artist searches for instruction on how to draw an owl, keeping a long-eared owl in mind, and finds only lessons on drawing a snowy owl, solving this problem without the skill of drawing from observation may be quite difficult. This situation is somewhat overwhelming; both birds technically are owls, but their appearances differ. Without the necessary skills, an artist remains dependent on someone who may be kind enough to produce the necessary tutorial. However, what’s the point in learning to draw this way if it doesn’t provide any real room for creative freedom? The good news is that we can become confident and truly independent with our drawing skills without relying on step-step-drawing tutorials! We are each unique as human beings. A method that may be great for one person may seem absolutely unnatural to someone else. We all have different approaches to the drawing process. For example, someone may prefer to draw from light to dark and from left to right on the surface, but another artist may prefer working from the midtones and edges inward. Both artists may be successful with each approach. Does this mean that the first artist is right and the second one is wrong? Of course, the answer is “no”. Here’s another example. Let’s say one artist has a strong inclination to create tedious details, but another is more expressive and attracted to looser mark-making. Both artists are capable of producing unique and equally interesting works of art. Neither approach is “wrong”, and both artists can be successful. It’s just a matter of our uniqueness, but copying a process that is outside of your “artistic personality” may prove to be challenging, uncomfortable, and disappointing. The key to avoiding this pitfall is self-awareness. Embrace your style and don’t try to be too similar to anyone else (even if you admire them). But there is another pitfall to be wary of. There is a chance that you may copy another artist’s mistakes without knowing it. Especially, if you’re a beginner. The key to escaping this pitfall is choosing your teachers and resources of information wisely. Some artists that create tutorials are more knowledgeable and skilled when compared to others and some are simply better at explaining concepts. Of course, we can learn something useful from anyone, without any regard to his or her skill level – but learning concepts that are incorrect can be hard to reverse. Finding your tutors is crucial for success. Don’t be afraid of investing money in quality information. There are even examples of mistakes found in famous, best-selling books on drawing. We are just humans, after all. No matter how skilled and experienced we are, there is still room for improvement. That’s why an independent style of thinking should become a habit for any artist. Learn from others, but apply what you learn in your own way. A tutorial allows you to create a drawing that is close to the original. You see both the process and the result. Having a clear step-by-step process is helpful, because you don’t have to think about the sequence of actions and techniques. It’s easy. However, too much dependance on this approach won’t help you to develop your own skills of visual analysis. It’s important to do the hard things because they actually work – if you repeat them regularly enough. Try to analyze the artworks you like. What techniques (color combinations, line characteristics) are attractive to you? Can you see an artwork in “layers”, imagining how it was created? Can you repeat or copy it? What makes this artwork successful? Another great tip is to redraw the same subject many times. For example, let’s say that you learned to draw something from a tutorial and followed it step by step. After you completed the first drawing, redraw this thing without referencing instruction. This may seem harder, but now you can evaluate what you’ve learned from the instruction. Let’s summarize everything we’ve discussed. Although we focused more so on the drawbacks of step-by-step tutorials rather than on the advantages, please understand that step-by-step tutorials are not evil. On the contrary, they can be a very helpful resource of information, displaying to us a world of skill, experience, and techniques that other artists have accumulated over time. In other words, step-by-step tutorials are simply a tool to educate ourselves. But like with any tool, it may become something that hinders our progress if we use it the wrong way. It can become a crutch, if we let it. So what’s a good strategy for truly effective growth? Make the time for other forms of drawing practice other than solely following instructions. Study drawing fundamentals and do simple exercises on drawing from life. Learn more about every object you draw. Study structure and how it functions. Details matter! Develop your skills of observation and analysis by studying the world around you and the artworks of other creators. Diversify your educational resources: find a teacher, take a class, read more books on drawing topics. And, by the way, the option of getting a feedback on your work is a huge advantage. Filter out the resources that seem to be just a waste of your time and attention. Practice regularly. Knowledge needs action to become practical! Please let us know what you think! Do you use step-by-step tutorials in your learning routine? What’s your experience? If you’re interested in the faster growth of your skills, please make sure that you check out The Secrets to Drawing course – it has all the necessary information on drawing fundamentals, drawing objects from life and building solid skills! Excellent,informative and just what I needed! Thank you for writing on this topic. Hi Matt, Thank you for this. I usually have my “own projects” -either from life or copying from a photo or painting – to add to the tutorials, which I find enormously helpful and illustrative. Many principles learnt there I can apply directly when I work on these projects of my own. Having someone to see our work regularly, to check it, would add… I find the critiques a perfect way of learning as well. I find you learn the general principles there richly addressed and from a wide range of variables, that teach us what is evaluated in an artwork. They are an essential piece to me, apart from the tutorials. Your courses are very good. Thank you. Regards from Argentina.